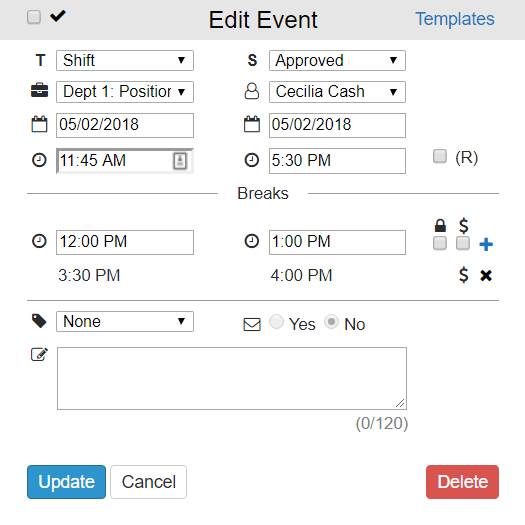 We’ve been hard at work over the past few weeks developing new employee scheduling features and updating our software design. Now, creating and editing events for your work schedule is easier than ever with our new event windows. Each data field is paired with an icon. Hover over each icon to see what information is required for the corresponding data field. The following table includes a breakdown of the icons and their definitions. We’ve also changed the style and formatting of the event window buttons for a more streamlined user experience. The ‘Update’ button is now blue and is separated from the ‘Delete’ button, which is now red. Employee scheduling doesn’t have to feel like a chore, and with our new updates, you can edit and publish your work schedule faster than ever.